Gredler et al. 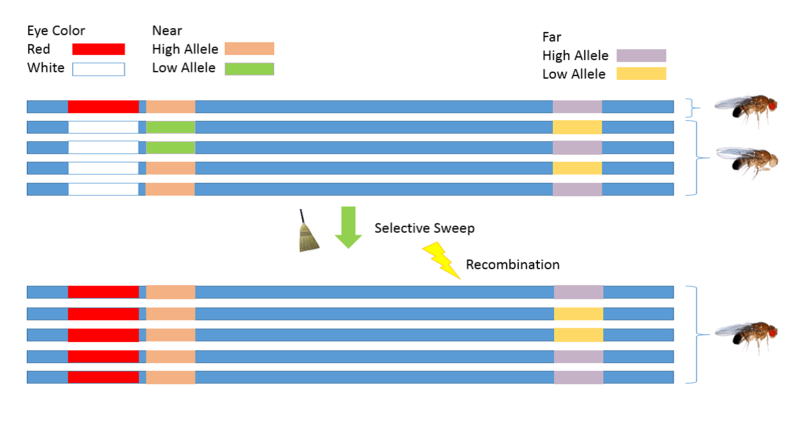 have designed an educational exercise for observing selection for increased frequency of an allele ("red eye color" in the figure below) in a population and demonstrating that linked molecular markers also increase in frequency based on their chromosomal distance from the eye color gene. The experiment was described in the paper "Revised college genetics laboratory exercise for witnessing phenotypic and molecular evolution in the fruit fly" and additional information is available on Mohamed Noor's lab webpage. The strains for the exercise are shown below. Teachers should note that the same strains are available from Carolina Biological Supply as part of a preassembled kit. The kit provides supplies, media, literature and relatively large fly cultures and Carolina specializes in supporting educators. We send only small starter cultures with no additional materials. Unless you are already proficient at rearing Drosophila and have the necessary supplies on hand, we recommend that you order from Carolina.